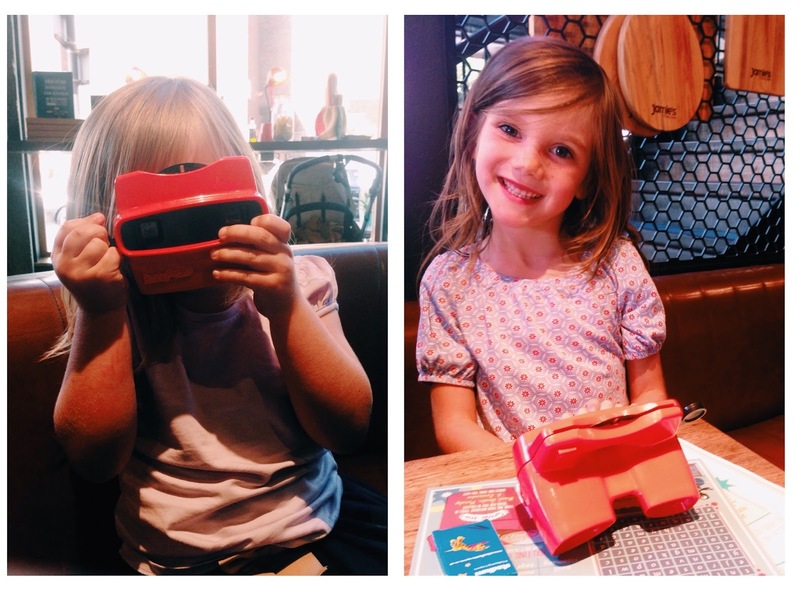 Earlier this month we were invited to review our local Jamie's Italian restaurant. 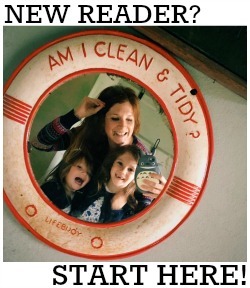 I've always loved eating in restaurants and enjoy it even more so now I have a family. 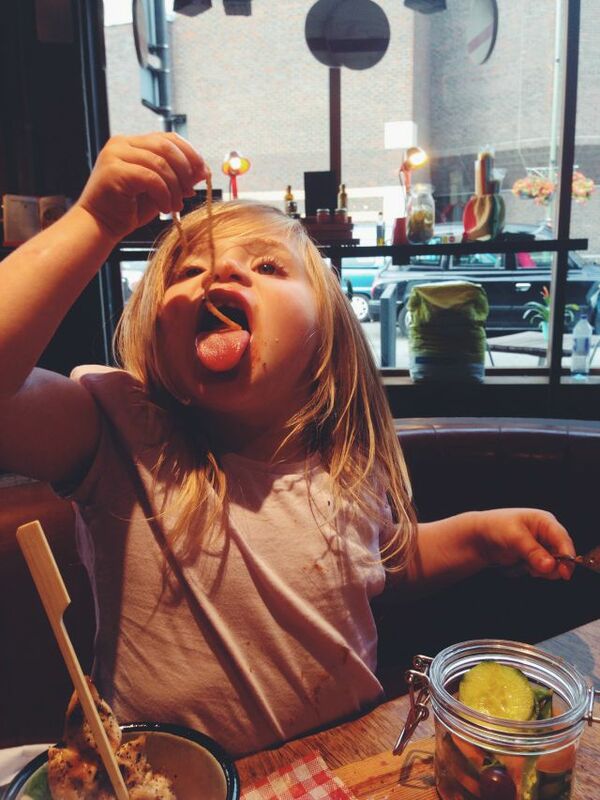 I like to encourage my daughters to eat as many different cuisines as possible; I also like them to experience dining out generally and am forever in search of amazing, authentic, family friendly eateries. We had friends visiting from Canada and thought it would be a nice treat for them to sample the menu of one of Britain's most well known and loved celebrity chefs so we arranged to take them to the Guildford restaurant for an early midweek dinner. We booked a table for five, at 6pm, which I think is still a very child friendly time to eat. 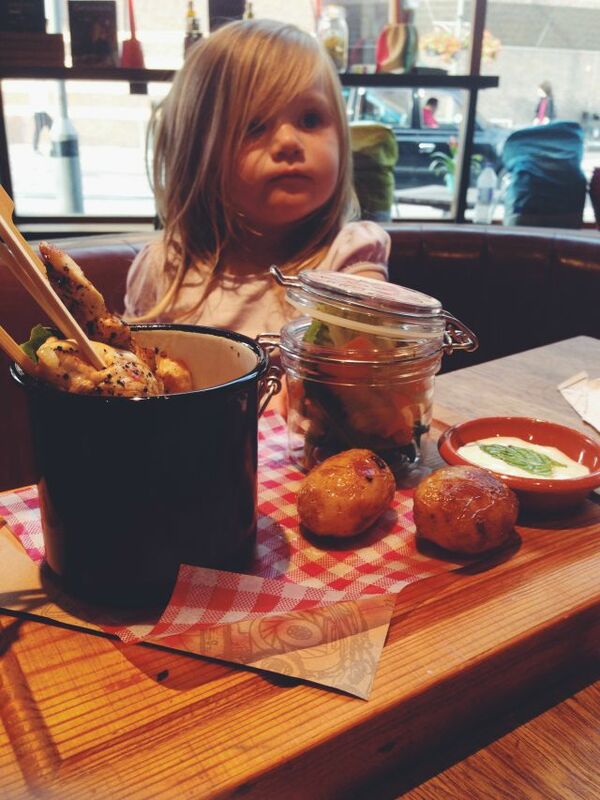 Although Jamie's Italian prides itself on being a family friendly restaurant (and it really is one of the most child friendly ones I've ever visited) I always like to avoid a later sitting as I don't think it's fair on other diners to have lots of over excited/tired kids in amongst them. We were greeted by lovely, friendly waiters who seated us quickly and efficiently. Not only were the kids given special packs containing colouring pages, crayons, a packet of herbs to sew back at home (how awesome?!) and their menu, they were also given vintage style view-masters with cards showing pictures of their food options - cue lots of excitement from the whole table, and I'm not just talking about the littlies! I also loved the decor of the restaurant. Lots of wood and terracotta and food and drink on display. Our waiter knew the specials without reading them from the specials board, he knew the ingredients in all the dishes on the menu (I had a few dairy free questions for him) and he was able to make excellent recommendations going on the things we all liked the sound of. I really like and appreciate that kind of knowledge in a waiter. Between us we got to sample a fair few dishes. We had a basket of artisan breads to nibble on while we waited for our food which contained freshly baked focaccia, ciabatta, seeded crackerbread, sourdough and grissini with an extra virgin olive oil and balsamic vinegar mix and a sun-dried tomato and olive tapenade. It looked - and tasted - so good that we contemplating ordering a second! The kids ate organic mini spaghetti and meatballs (made from Lower Hurst Farm beef and served with Jamie’s organic seven-veg tomato sauce, homemade spaghetti and a sprinkle of Westcombe Cheddar) and happy chicken lollipops (freshly made lemony organic chicken fillet lollipops with baked hedgehog potatoes and crunchy nuts and seeds). All three meals were served wIth a fresh shake-me salad (which the kids LOVED) and an apple juice. Not many kids menus include a drink, so this was a nice touch. I chose the summer risotto from the Specials board which I would totally recommend (there is a similar one available on the regular menu). I'm supposed to be dairy free but couldn't resist. My friend had the three cheese caramelle (beautiful filled pasta with ricotta, provolone, Bella Lodi and spinach, served with creamy tomato, garlic, basil and rosé wine sauce). Breaking my dairy free rule I went on to have the velvety mascarpone and Amalfi lemon meringue cheesecake for pudding, which came topped with Italian meringue and served with lemon curd and blackcurrants. It was SO GOOD. 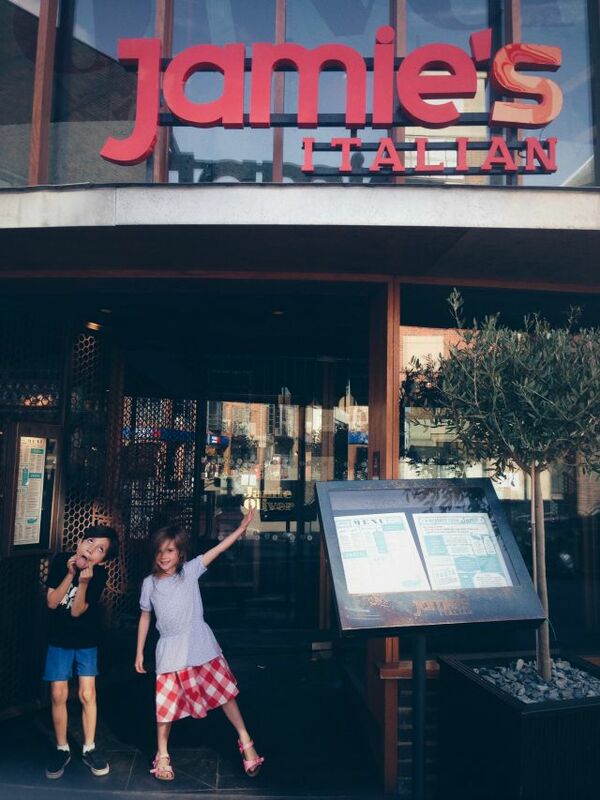 We had a wonderful experience dining at Jamie's Italian. A meal for five of us, including (non-alcoholic) drinks came to just £60 and our guests also bought some souvenirs to take home which were very reasonably priced. I will definitely go back with the girls; kids meals cost £6.50 (or £6.95 for a slightly larger portion) and desserts are only an additional £1.25. There aren't many restaurants where you can get your children such a nutritious, balanced and FAST two course meal (and drink) for less than £8. I also liked that despite being an Italian chain, there was more on offer - for both children and grown ups - than just your regular pizza and pasta dishes. There are now 41 Jamie's Italian restaurants across the UK and the Guildford one can be found at 13 Friary Street (GU1 4EH). We were given complimentary meals at Jamie's Italian Guildford in exchange for this review but all thoughts are genuine and my own.